Tired of job rejections? Want to stand out from competition at a job interview? Look no further. Now, it is possible to get your application noticed in no time, without a need of extra design skills and barely any costs required. Push your animated content! Technological evolution has turned around the way we act on a daily basis in each and every moment of our lives. In addition, we want our wishes to be fulfilled in an immediate manner, requiring a simple solution with a little effort and even a bigger result. But what if I told you that it is perfectly possible? In order to keep up with the technological change or even surpass the standards, stop looking back at the conventional way of thinking. Embrace the innovation. Certainly, Moovly got something to help you! Job applicants know that to get the best piece of cake at a job market you need to present the most powerful CV and be ready to compete with rivals. Surely, everyone can have a different “cake”, but have you found your cherry on the top? Try the strategy of video resume, such as an Animated CV! It is not anymore about the quantity of experiences and groundbreaking projects you will put on paper, it is how you portray the ones that will actually make a difference. Video is another way to show that you can walk an extra mile for that position. Knowing that 65% of the world population are visual learners, there is a high chance your potential employer would appear to be one as well. To increase recall of your profile after a dozens (if not hundreds) applications reviews, it is vital to make sure your information will be stored in a long-term memory of your position’s “decision-maker”. It can be done by pairing given concepts with relevant visual assets. Research has shown that after 3 days, the learning recall of the provided information was 6.5 times higher when using an illustrated interpretation rather than written only. Therefore, think twice when deciding on the CV style and its effect on your application approval. Here is an example of what your CV could look like today. Done by an average user of Moovly. Interested? Sign up for a free trial and make one yourself! Why & How To Give it a Shot? To understand the true power of visuals, take a look below. You have just processed the picture 60,000x faster than the text because visuals reduce time spent on extra explanation. The same effect can be passed on to your CV. How? Pinpoint key elements of your value as an employee, then show rather than just tell the story behind your assets. Keeping it short and focused is the definition of professionalism. The way you use animated material not only adds more style and extra 10 points to your “qualified Gryffindor”, but also shows deeper insights into the personality, hidden capabilities, creativity and willingness to take a risk, which outdated paper CVs fail to portray. With a more visually engaging resume the authenticity of a message is never lost. An animated CV has an ability to build a more genuine and true connection with a reader. Animated CVs can directly become canvas for showcasing your talents in practice. That gives an opportunity to not only mention the credentials you hold, but provide an employer with a visual proof of how creative you are able to get in a daily task related to the targeted job, demonstrate presentation skills and an unconventional approach to your professional thinking. Infuse your application with a dose of innovation. Our brains are, mainly, image processors. Visual interpretation will help to improve comprehension of your resume, as well as increase retention of your profile. Keep in mind, overload of visuals can be distracting, therefore, use it smartly and enhance your professional story by adding images that boost the overall value. All together, a concise content with accompanying meaningful graphics is a central figure of standing out from the crowd. Metrics is a language of business. Every time you quantify your achievements with extra $ and % signs, you build up more credibility. This way, an employer can estimate your potential level of contribution to the organizational goals. Visualize those numbers and bring attention to the impact you are planning to make. Just note, not everything that can be counted counts; thus, pick carefully the points that are of a true importance. Use an animated video to walk an employer through your professional path. Instead of using adjectives everywhere throughout the text, use storytelling to show real-life actions you have performed. Remember, your resume is not a shopping list: stop reading your tasks one by one, but make a relation between accomplishments rather than duties. Moreover, stories trigger the release of hormone oxytocin that is in charge of stimulating empathy and trust towards the narrator. Therefore, use the technique of storytelling to attract the brain of a reader with an accompanying engagement and a greater interest. In order to get through the competition, it is relevant to stand out in your own personalized manner. Animated CVs give you a chance to move from the conventional. You would ask, why to move? Normality is a paved road: it is comfortable to walk, but no flowers grow on it. Do not stay unnoticed, ‘Moov’ another direction! Try it now and decide which side to take: an old-school approach together with most of the other candidates or an innovative one with us? Right, the latter one. Give it a go! Out of ideas? Get Moovly Pro and use this customizable pre-made CV template to help you beat the competition! Drag & drop it into your video, change your details, and enjoy the success! 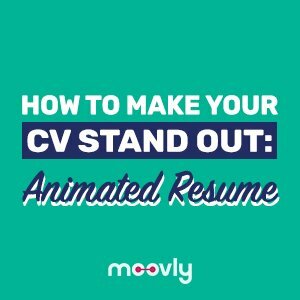 New approach on how to make your CV stand out from the competition with the use of animated content. Create your resume with Moovly!